Microsoft CEO to leave position within 12 months following appointment of successor. Microsoft has announced that current CEO Steve Ballmer will retire within 12 months, pending the appointment of his successor. The next CEO of Microsoft will be chosen by a special committee, which includes founder Bill Gates and other board members. 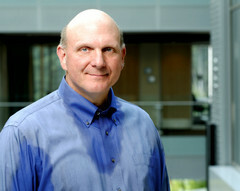 Ballmer first took over the reigns back in 2000 when Bill Gates retired, and was popular for his over-the-top antics when speaking at keynote events. His tenure at Microsoft was highlighted by a move away from focusing solely on PCs, and his moves included a takeover of Skype for $8.5 billion, a strategic partnership with Nokia in 2011 and a failed $47 billion attempt to purchase Yahoo. Unfortunately, Ballmer was also blamed for the stagnation in Microsoft's stock and the company's inability to maintain pace with Apple and Google, eventually culminating in this "retirement". There has been much speculation regarding Ballmer's successor at Microsoft, with in-house names such as Nokia CEO Stephen Elop and former Skype head Tony Bates being thrown around. Of course, the Microsoft job will definitely appeal to numerous executives from all areas, and it would not be surprising to see someone chosen from outside the company ranks.